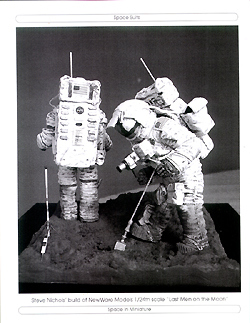 Overall Rating: 10 - Everything you need to build and paint accurate NASA space suits of any era, in any scale. 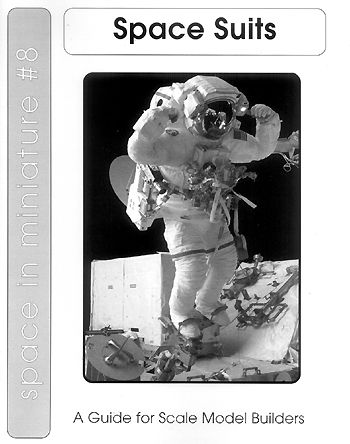 The eighth book in the Space in Miniature series describes all of the space suits developed and used by NASA from Project Mercury to the present day (2012). Researched and written by Karl Dodenhoff, this 58 page book contains over 100 line drawings and photographs to complement the detailed text, providing a comprehensive "one stop shop" reference on the subject. It covers everything from the earliest manned space program suits to the free-flying backpacks used by Space Shuttle astronauts. 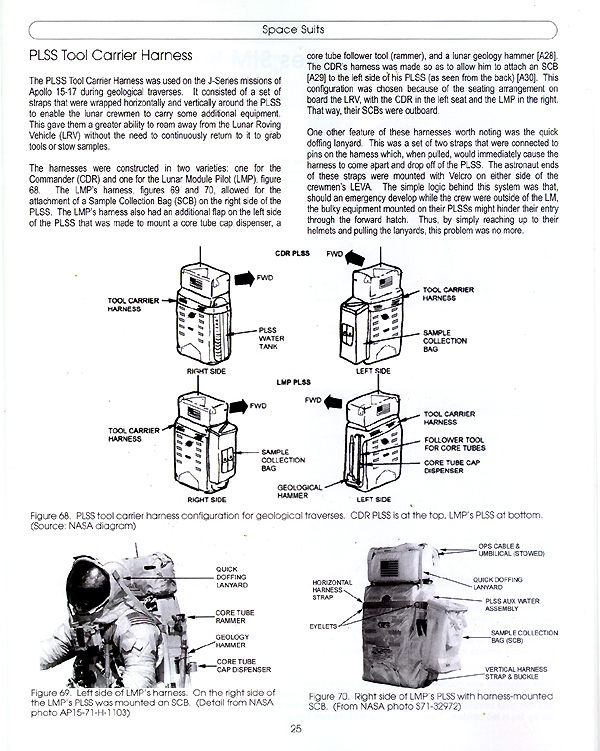 Also included is a thorough listing of all the available (as of printing) scale model kits, along with kit reviews and a detailed feature on building an accurate rendition of the old Aurora "American Astronaut" kit. Apollo, which details the various suits, life support and associated equipment used during the Apollo program. So much material was collected that a special addendum is available in PDF format for those who purchase the book. This 26-page "Photo Appendix" provides a number of images, much larger than could be published in the book, and many in color. 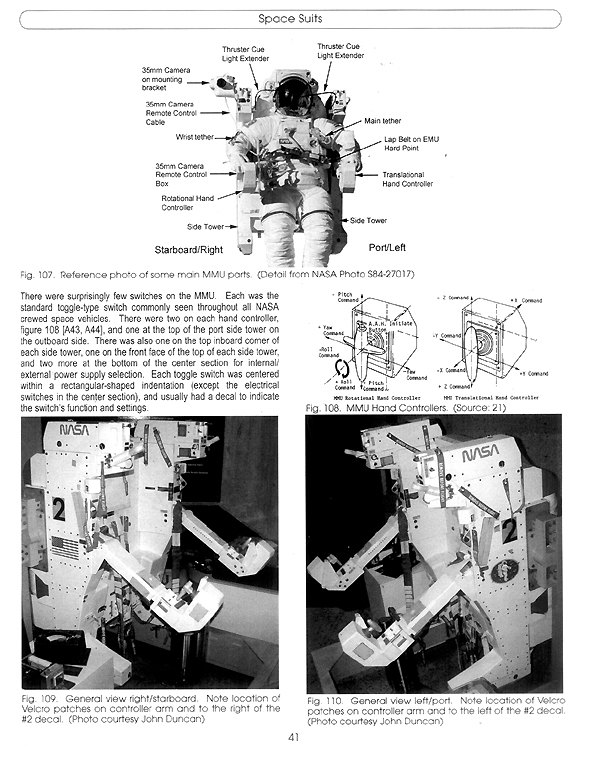 It also includes an illustrated article on modelling the Apollo J-Series SIM Bay EVA. Links to color versions of many of the photos used in the book may be found at the Space in Miniature website (though as of this writing it is not complete). The book is written with the scale modeler in mind. As such, there's less emphasis on history and personalities, and quite a lot on details. 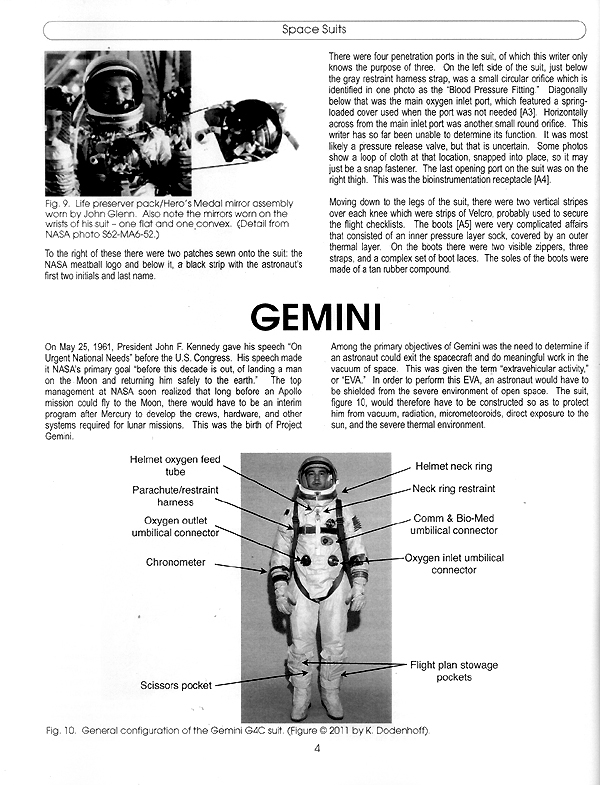 For each period, the author provides as much possible on what the suits and associated equipment looked like (right down to the colors of the straps used to hold things in place), what the sub-assemblies were and how everything fit together, and how each was used in space. He also points out gaps in available information, though in most cases these gaps are not a hindrance to making accurate models (i.e. "suit restraint harness" may not be what NASA called it, but that's less important than knowing it consisted of grey and white straps). The writing style is clear, concise and appropriately descriptive. For example, " Overall, the suit was a semi-gloss silver color. The silver thermal covering layer of the suit looked almost like duct tape." The photos and diagrams included are clear and helpful for determining what went where. Since all photos are in black and white, they are not as helpful for figuring out colors - but color call-outs are included in the text, and of course there are the images online to refer to as well. This is the most comprehensive reference you will find covering NASA space suits over the past 50 years. If you want to learn about the evolution of the suits, and modelthem accurately, you will want this book. It is certainly reasonably priced, and the online extras are worthwhile. Many thanks to Space In Miniature for providing the review sample. Manufacturers and retailers, interested in getting your wares reviewed and publicized on a site averaging 6000+ readers a day? Contact us! This page copyright © 2012 Starship Modeler. First posted on 3 July 2012.